He was on his second tour with the Pacers when we sat down for this conversation in the media room at Bankers Life Fieldhouse. He had been brought in to help fill an injury-depleted roster, and did it awfully well. He averaged 10.5 points in the 10 games he played, including a 22-point game in a win over Utah and a 21-point game in a win at Chicago. He quickly became a fan favorite because of his pleasant demeanor and tenuous status. Injured players with guaranteed contracts were coming back, and he was going to have to be released. Cleveland, which had cut him early in the season, reclaimed him and kept him most of the season, then he finished with Phoenix. He’s the classic journeyman point guard, a player capable of helping any team, but always in danger of being replaced by a better or younger player. 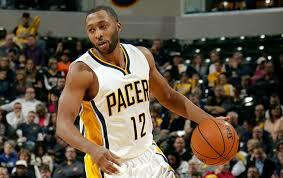 A second-round draft pick of the Pacers, he lasted three seasons with them the first time around. He was a popular locker room presence, but was let go. His best season came the followed year with Washington, when he started 22 games and averaged 7.7 points, but the merry-go-round never stopped. All in all he had played for six NBA teams by the age of 28. He’s hoping to get to play for a seventh. You can tell from the conversation why he’s popular in the locker room. He’s got some hard history behind him, including a near-death experience and a brush with the law in college, but you wouldn’t know it by talking with him now.